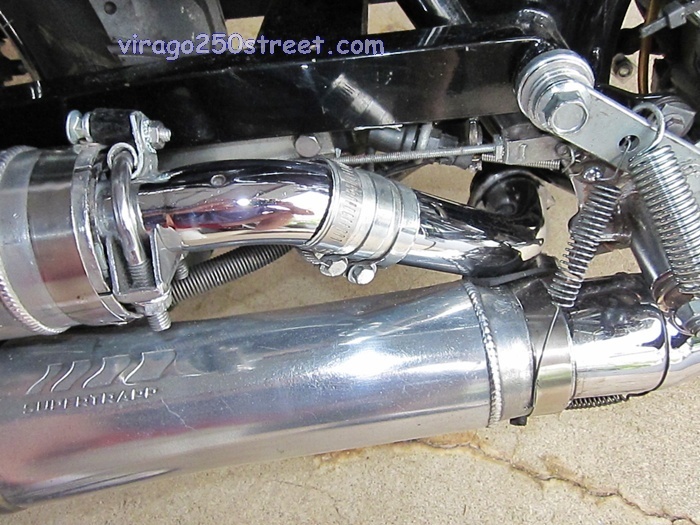 The stock Virago 250 exhaust is 2 – to 1 – to 2 with a mixing chamber. The rear pipe joins the front pipe at a 90° angle about 3 inches before the mixing chamber. After the mixing chamber, the upper muffler gets about 1/3 of the exhaust flow, and the lower muffler gets about 2/3 of the exhaust flow. 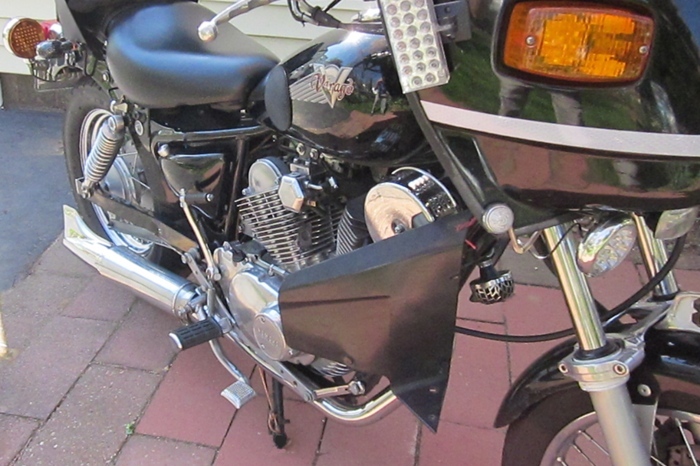 My Virago exhaust was 2-to-1 with a Supertrapp muffler connected to the front part of the original exhaust. Now I ran the rear pipe to a 2nd Supertrapp muffler for 2-to-2 with no interconnection between the two sides. It improved the sound quality maybe 30% and the power seems about the same. By comparison, I just removed the mixing chamber from my other bike and it improved the sound 100% – but the Virago sounded good before the mod. 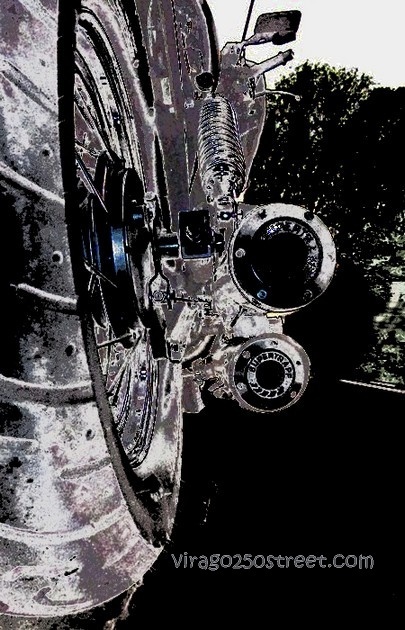 Below 3,500 RPM – The sound is much better at idle and at lower rpm (below about 3,500 to 4,000) – this is the best the bike has ever sounded. Over 3,500 rpm – My first impression is that it sounded better when it was 2-to-1 with the Supertrapp muffler or the original exhaust system – but maybe the small exhaust leaks that I still have are sabotaging the sound. It seems about the same so far. I just changed to 17/38 and it bogs somewhat in top gear – especially with a headwind – but it was doing that before I went to 2-to 2. It would be cool to put on a stock exhaust to see if there was any improvement in torque or power in top gear. Is 2-to-2 mod hard to do ? Some people will find this mod to be difficult. It would be easier if you knew how to weld ( I don’t). My first attempt worked, but it did not turn out so great. 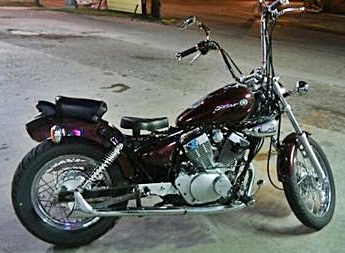 If I could not do this, I was considering the exhaust system made by larish41 on the virago tech forum site. step 1) Mount the flange end of the chrome rear fake pipe to the rear black pipe. You need to bend the flange inward so that it will fit. The rear pipe is one inch OD and the chrome fake pipe is about 1.5 inches ID – so you will need several layers of thin sheet metal so that the 1.5″ID pipe will fit the one inch OD pipe. Stainless steel radiator hose clamps are not the best for this purpose, 1 1/2 inch car-type exhaust clamps (Autozone $2.39 each) work much better – you need more force to reduce the exhaust leaks, so the SS clamps will become stripped. step 2) You need to cut the fake shrome pipe end opposite to the flange end at about 5.25 to 5.38 inches. Then re-mount this short pipe to the longer section of the chrome (no longer fake) rear pipe. Angle it so that when the muffler is mounted, the muffler faces the rear the way you want. The angle will be about 35° to 40°. The short part that you just reattached is upside down now compared to it’s original position on the bike; the drain hole should face upward, angled just slightly to the right maybe 1° or 2°. step 3) Mount your muffler to the chrome pipe. 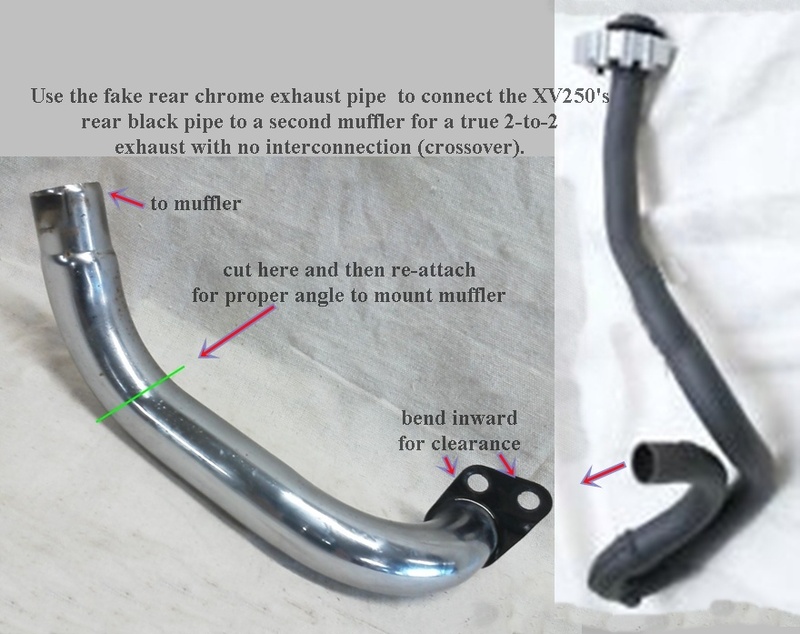 The chrome pipe is 1 5/8 inches OD, so if you muffler is larger than that you will need several layers of thin sheet metal to get a tight enough fit. The key to making this work is: having or getting 7/8 inch bars (used is OK), preferably aftermarket not OEM. Once you remove the inner lip on the rear cylinder exhaust pipe, 7/8 bars will slide right on, with a fit tight enough you don’t even need an exhaust clamp. 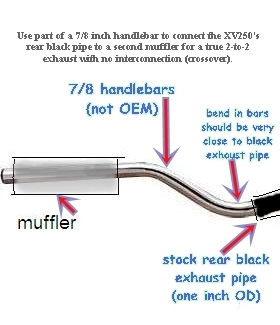 If you cut the bars so that the bend occurs right after the connection to the the rear cylinder exhaust pipe, you will probably have enough clearance to fit the new muffler over the existing muffler; the mufflers will be about one inch apart. When you slide the bars on the rear cylinder pipe, the bend should be immediately after the joint, and the bars will be aimed up and back. If you can do this, the difficult part of the project is done. is about .875 inch (7/8″) ID. The factory pipe is made out of some sort of upgraded steel. 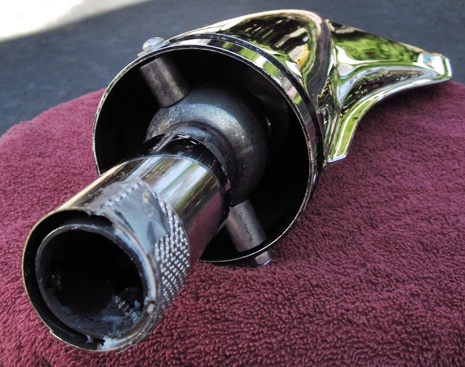 If your pipe is exposed (moved keyswitch, removed fake pipe, removed passenger pegs, etc), polishing it is a good idea. It is quick and easy to polish – it won’t look like chrome but it is close enough. The rear black one inch OD exhaust pipe possibly has good heat sink properties – when the front and rear pipes are no longer interconnected, you will find that the rear cylinder muffler runs 20° to 30° F degrees cooler than the front. I changed my Supertrapp “bottom-facing slot” from two discs to one disc – the bike is much quieter now – hopefully my ears won’t be ringing as much from the 1.5 to 2 hour ride home from work. Maybe it will increase torque, too. The fish tail you had on your bike looked pretty cool. I like the seat, too. What size is your rear tire ?